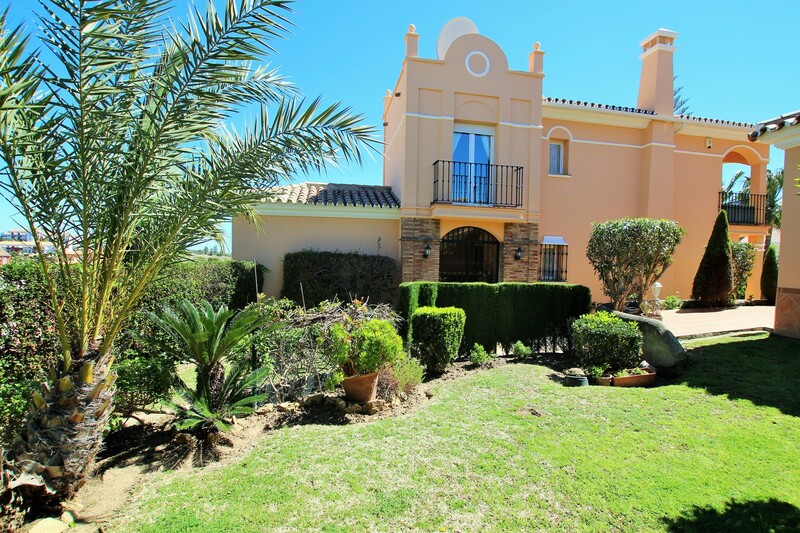 Immaculate south facing villa located in a pristine community of villas in a quiet cul de sac sharing a communal pool in mid Riviera del Sol. The house sits on an easy to maintain plot with front and side garden with sea views. At the rear there is a lovely half shaded and half open Andalusian patio with water feature, perfect for barbecues and relaxing. At garden level there is a sunny south facing terrace with access to a spacious living room with fireplace, an independent kitchen that access’s the rear patio, a hallway with WC and stairs to the upper level. On the upper level you have 3 double bedrooms, one en-suite, 2 of which have access to a large south facing balcony with sea views. There is a large garage/basement with stairs directly into the house, here there is room for a car, office space and plenty of storage, it is possible to convert some of this space into extra bedrooms for example. From the garden you have access to a huge communal swimming pool with gardens. At the front of the house there is a covered car port exclusive to the community and a space for each owner as well as one at the rear . The private garden is maintained by the community so no need to worry if you don’t reside here permanently, when you return the garden will be in a perfect state. Amenities and beach are around a 20 minute walk or 2 minutes by car. This is a fantastic property that will sell quickly! !